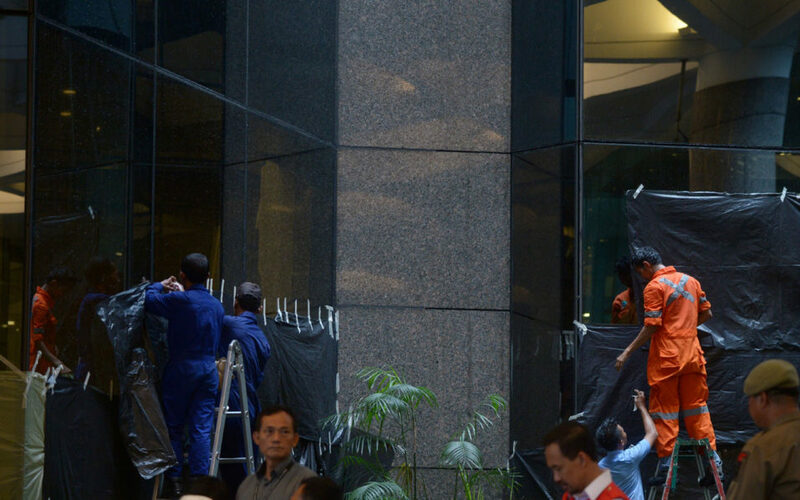 At least 75 people were injured Monday when a mezzanine floor at Indonesia’s stock exchange building collapsed into the lobby, police said, with victims carried out of the debris-filled building on stretchers. A cascade of glass, metal and other material crashed onto the ground floor when part of the mezzanine level gave way. A Jakarta police spokesman said the collapse was an accident and not the result of an exp0losion. National police spokesman Setyo Wasisto told AFP 75 people had been injured. There were no reports of deaths so far. Television images showed chaotic scenes as victims were taken to hospital or lay on the ground outside the tower complex in the centre of the sprawling city’s business district. “I saw many people bleeding,” student Rizki Noviandi, who was taking part in a competition at the exchange building, told Metro TV. The lobby was filled with debris and toppled-over plants near a Starbucks coffee outlet, as hundreds of building employees were evacuated. “Our search and rescue teams, the police, doctors, the firefighters are all still working,” Wasisto said. “They are cleaning the debris and also searching for other possible injuries,” he added. Those hurt mostly sustained injuries to their legs and arms, said Jakarta police spokesman Argo Yuwono. “The accident happened at the first floor… It’s a floor where many employees are passing by… There are some victims but they have been taken to a nearby hospital,” Yuwono told reporters. The accident happened in one of two towers in the complex. “There was a sound, like something had fallen off a building structure, for about 20 seconds. Everyone was panicking and people were immediately being evacuated,” Amailia Putri Hasniawati, a journalist based at the exchange, told AFP. It was not immediately clear what caused the accident at the tower in Sudirman district, which was built in 1995. In 2000 at least 10 people were killed and dozens injured by a car bomb at the exchange complex. Despite the chaos Monday, stock exchange spokesman Rheza Andhika said trade continued as usual in the afternoon session. The accident happened shortly after noon local time (0500 GMT) while the market was on its lunchtime break. “There was a lound banging so people who were inside immediately ran outside of the building,” said Metro TV journalist Marlia Zein. The local office of the World Bank is housed on the 12th floor of the complex, according to its website. Reports at the time of the 2000 bombing said one of the men responsible was a member of the Free Aceh Movement, a separatist group which had been fighting for a free Islamic state in Aceh province since the mid-seventies. Some 200 cars were also damaged in the blast when the bomb exploded in an underground parking lot of the stock exchange building.